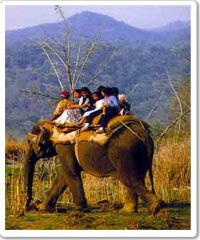 Royal Wheels India is an adventure travel group organising Jim Corbett National Park Tour Package in India. One of the finest habitats of the tiger in India, the Corbett National Park nestles in the foothills of the Himalayas in Uttaranchal, in the area known as South Patlidun. With it's varied topography, diverse flora and fauna and the natural splendour of its landscapes, the Park is a precious heritage. Established in 1936, this reserve was known as the Hailey National Park. It was later renamed after Jim Corbett the famous hunter, author and pioneer conservationist who helped set up this wildlife sanctuary. At present, this national park encompasses an area of about 520 sq. Kms whish includes, the vast reservoir formed by the Kalagarh dam across the river Ramganga. It is one of the best manged protected areas in the country and attracts thousand of visitors each year. 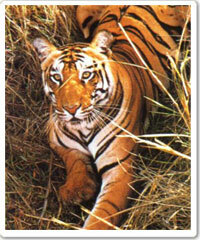 This area is also a tiger reserve under the Project Tiger. The Park is a large valley with forested ridges running through it. The magnificent Ramganga River winds through its entire length in a south - south westerly direction and numerous forest streams and rivulets that flow into it carve up the area into little ridges and ravines. Dense stands of sal and mixed deciduous forests are found throughout the Park while the 'chaurs' or the grasslands in the valleys - about one -tenth of the core area, offer visitors a better view of wildlife. With elevations in the Park ranging from 400m to 1210 m there is a rich diversity in habitat. Animals of the Himalayas and those of peninsular India can both be seen here and over 50 mammal and 25 reptile species have been recorded at Corbett. Among the predators are the tiger, leopard, diverse species of lesser cats and the dhole - the wild dog. There are antelopes (nilgai and ghoral) varieties of deer (hog deer, sambhar, chital or spotted deer and barking deer), the primates (rhesus and langur) and other animals like jackals, foxes, civets, wild boar, sloth bear, black bear and a range of reptiles including the cobra, python and two species of crocodile. The rare fish eating, long snouted gharial and the more robust mugger can be seen basking along the sand banks and pools of the Ramganga. The river which is also noted for its sporting fish, the mighty mahaseer and the malee is popular with anglers. Corbett is the home of 580 species of birds including water fowl, 17 types of woodpecker, raptors like the Pallas fishing eagle, harriers and kites, peafowl, kalij pheasant, the rare chir pheasant, red jungle fowl, minivets, shrikes, cuckoos, drongos and barbets. A fine reservoir on the river formed with the building of a dam at Kalagarh now attracts diverse species of water birds - both local and migratory. With its avian variety Corbett is a marvellous location for bird watchers also. With the Project Tiger launched in 1973, for the total environmental protection of this endangered species, Corbett has seen an increase in the tiger population. This nocturnal predator is not often spotted during the day though its pugmarks are commonly seen along the road sides and forest trails. With a bit of luck, visitors do occasionally catch a glimpse of this majestic animal as they drive through the park to the Dhikala complex. at the heart of the core area is picturesquely located at the edge of a grassy plateau perched high above the Ramganga reservoir and set into a bend in the river. The grasslands of the Dhikala Chaur disappear into the dense sal forests of the foothills. about one every 5 sq. Km. Splendid herds of Chital, hog deer and elephants are also to be seen here. There are viewing towers as well as elephant rides for visitors - morning and evening. This is perhaps the best way to see wildlife for it is possible to go deep into the park on elephants, to get close to the animals in an unobtrusive manner and to get a clear view of them. Being the centre of tourist activity, a range of accommodation is available at Dhikala, including 3 room cabins ( with coolers or air conditioners on request, and attached baths ), forest rest houses, three bedded huts, Swiss cottage tents and log hut dormitories. Restaurants, a library, a field post office, first aid centre, an open air theatre and a provision store are some of the other facilities available for visitors. Corbett also offers a number of forest rest houses located in picturesque spots around the park, isolated, ideal for wildlife enthusiasts, photographers, anglers, bird watchers - who wish to enjoy and feel the jungle. Just 9 km. from Ramnagar - where the Park headquarters is located is the fine 6 room rest house at Bijrani. A big chaur close by, where the deer collect at night, is ideal for watching the animals and elephant rides are available for visitors. Along the route to Dhikala and soon after the entrance gate at Dhangarhi is another charming two room rest house at Sultan.